Argentina Futbol Club was directed by acclaimed Argentine Director Juan Pablo Roubio, and co-written and co-produced by local Seattle filmmaker, Gavin P. Sullivan. Sullivan along with the film’s co-executive producer, Ben Meyerson, will be on hand for Q&A. Argentina Futbol Club premiered at the 31st International Festival of New Latin American Cinema in La Havana, Cuba and will screen at Molodist Kiev International Film Festival, and Cinesul Film Festival in Rio de Janeiro. To anyone going SIFFing this holiday weekend, I highly recommend Marwencol, a documentary about trauma victim Mark Hogancamp’s unique form of art therapy: he dresses up G.I. 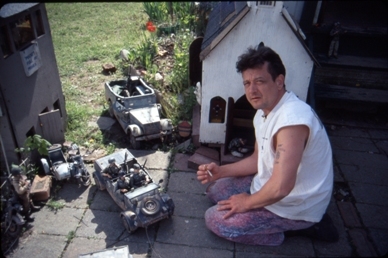 Joe and Barbie dolls as people he knows, uses them to act out elaborate cinematic fantasies in a fictional WWII-era Belgian town he has built in his backyard, then photographs the results. Hogancamp’s photos have caught the attention of the art world, giving him an opportunity to re-engage with society – or not. Director Jeff Malmberg is scheduled to attend both performances. SIFF is also screening Rouge Ciel, which offers a larger perspective on outsider art: it includes a historical survey of Art Brut (this is a French film), conflicting opinions on the meaning of outsider art, and several case studies. The latter include Chicago janitor Henry Darger, whose 15,000 page fantasy novel and accompanying illustrations were the subject of a fabulous exhibit at the Frye a few years ago (as well as the excellent documentary In the Realms of the Unreal). Just a reminder that we are accepting applications for our House Manager position (part time, paid) and Volunteer Coordinator (4-10hrs/week, unpaid). Full job details and application deadlines available here. The AP is reporting that jailed Iranian filmmaker Jafar Panahi has been released today.This is wonderful news. Thanks to everyone who kept reporting on this issue and all who signed the Seattle petition for any influence it may have had. The National Endowment for the Humanities (NEH) is offering filmmakaers money for documentary projects that examine international and transnational themes in the humanities. To ready about it, and to apply, go to the NEH site. The deadline is July 28.